I mowed the yard today, for what should be the last time this season. 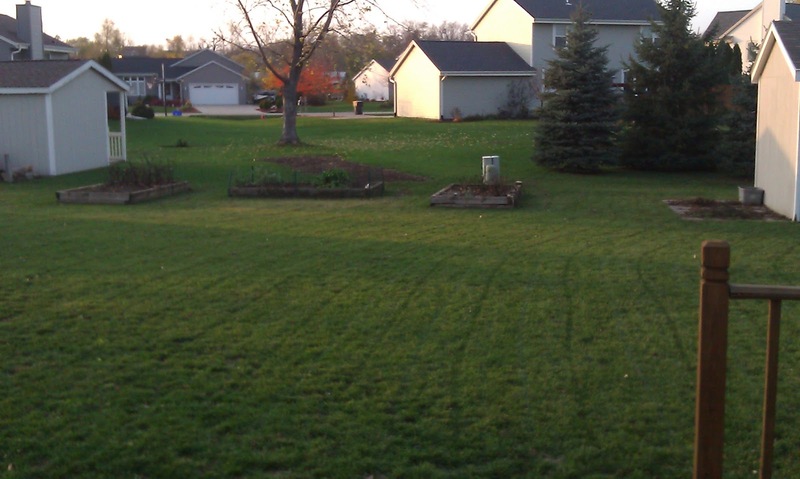 75° in October, and I mowed in shorts and a t-shirt! It was good to have a reason to get outside and enjoy the weather. The yard does look better now. At least the back yard looks pretty good. It's nice and green. The front? Well, at least it's mostly green. Or partly green. The summer was so dry and hot that the grass went all brown and dormant. Then when we started getting some rain, weeds started growing where the grass should have been. The grass started growing, too, just not as quickly. A lot of times mowing just meant chopping down the tall weeds and rogue grasses scattered through the yard - and it's practically impossible to see where you've been and where you still need to go. I usually end up mowing over the same places just because I can't see. I know I do. If I could actually mow in a straight line, that might help. Right now some of the weeds that first took over the yard - and were at least green - have turned brown and dead, and there is a bit of grass coming through. Maybe there's some hope. I'm sure there's something we should be doing to take care of it, get it ready for winter, and encourage the grass to come back, but I have no idea what. I just mow. And comfort myself with the knowledge that we're not alone in this. Other yards in the neighborhood are in the same shape. And while I'm mowing I'm also thinking maybe those smaller lots in Champaign won't be all that bad. Instead of taking an hour or an hour and a half to mow the entire yard - depending how many times I stop to get a drink, blow my nose, or clean out my shoes - I might be able to mow in half an hour. Or 45 minutes. Of course, I won't get as much exercise doing it.